We use vacuum trucks to pump sewerage sludge from large sewer treatment plants and to clean lift stations and manholes in the sewerage collection system. Call our office today to discuss the needs your sewer system has that we may be able to help with. 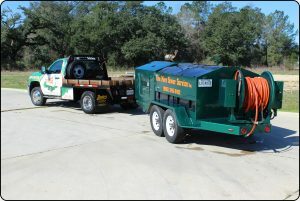 Flow More Sewer Services, Inc. uses mobile dewatering boxes manufactured by Aqua Zyme Disposal. We can provide your sewerage treatment facility with a dewatering system to ensure that concentrated sludge is removed from your facility. Contact us about rental or purchase of an Aqua Zyme Disposal Dewatering System. 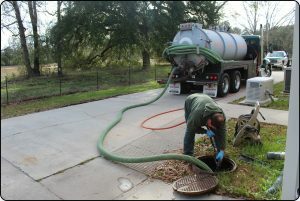 High pressure water jet cleaning removes debris from drain and sewer lines. We use “water jets” to clean sewer lines from 4″ to 54″ in diameter and up to 400′ long from a single access point. Water jets are used to remove sewer sludge, grease build-up, sand, rocks, and other debris from the sewerage line. This will enable the pipes to flow at full capacity. Various nozzles and attachments are used to help clean the line. One such attachment is a root saw. This attachment is used to remove small roots and grease builds-up in sewer lines under certain conditions. Call for more information on “Water Jetting” and sewer line cleaning.